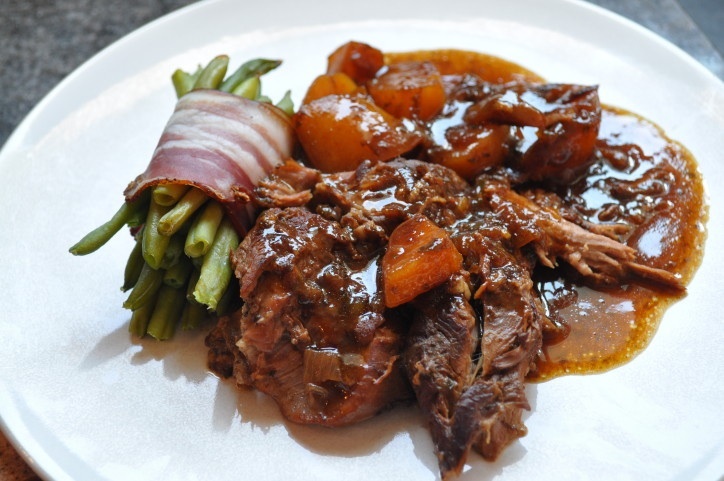 If you have ever been a bit disappointed by a leg of lamb….be it too fatty or too tough. This is the one for you, succulent and soft as butter…. I promise you will never cook lamb the way you used to ever again!! Don’t be put off by the seven hours cooking it is dead easy!! Preheat the oven to 120 degrees C or 248 F, gas mark 1/2. Season the leg of lamb with salt and pepper to taste. Put the casserole or roasting tin on the hob and brown the lamb thoroughly on all sides (it is important to do this now as the meat will not brown in the oven). If the lamb sticks add a little oil to the casserole. Drain away any fat that has gathered in the bottom of the pan. Add the vegetables to the casserole along with the white wine and stock. Season and bring to the boil. Put on the lid or cover tightly with tin foil and place in the pre heated oven. Bake for 7 hours, turning twice during this time. The meat will be cooked after 5 hours and offer no resistance to the knife. The meat requires no resting time when cooked in this way. Transfer the meat and vegetables to a serving platter. Strain the meat juices into a jug and pour or blot away the fat with kitchen paper. Pour the juices into a pan and boil vigorously until reduced by a quarter. Adjust the seasoning and add the Armagnac or Madeira. Garnish the lamb with the sprigs of thyme and serve with the sauce. Use a spoon to carve and serve the lamb – a la Cuillère as the French call it. It is deeeelish! !